I just noticed this in my Action Log and I'm wondering if it's just because the breeding and auto-abandoning happen so close together that the log gets confused, or.... What. Whatever the reason, it does seem wrong to put the auto-abandon log *before* the breeding log. @HeatherMarie I noticed that with one of my breedings. Again, it was when I was doing a run of autoabandoning to the AP. I think it must just be because there is only a split second between the breed action and the abandon so they are happening at virtually the same time. I just saw it as a curiosity, not really something that needs to be fixed, although I guess if there is an easy way to fix it the log would be more accurate. 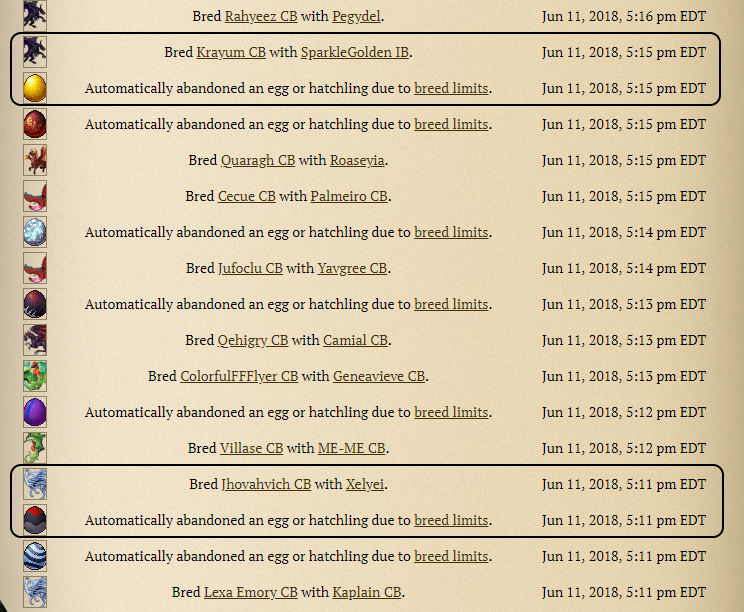 It looks like the site is calculating the egg will be auto-abandoned before the dragons even breed, which makes some sense logically if on the code-side that check's done first so the autoabandon action happens first, but it is still weird to see that. Minor, but nice fix to have. It was only a few of the eggs that autoabandoned while I was breeding that showed up that way, though. The others were in the usual order. Yeah, it's only a small handful, not all the time... It does totally make sense that it would show that way if the site is calculating the auto-abandon before the breeding technically goes through or whatever, but that doesn't really make sense when only a few show like that and the others show 'normally'. As can be seen in the screenshot I posted, other auto-abandons that happened in-between the two examples are shown as abandoning after the breeding, the way you'd think it should be. The auto-abandon just has the same timestamp as the breeding itself. Then when these are inserted into the database, whichever happens to be processed first shows up first in the log. Well it WOULD show the same time, as it doesn't show seconds.... and it's never going to take a full minute to ait.